This post is by Cassily Charles from Charles Sturt University and fellow Thesis whisperer. Cassily is the Academic Writing Coordinator for Higher Degree by Research students in the CSU Academic Support Unit (ccharles@csu.edu.au). In this post, Cassily follows up her eariier post on misunderstandings about personal writing processes, and how they can lead to conflict between students and supervisors. In this post she writes about… Meerkats? Take it away Cassily! OK, weird title I know. I’m working on an extended metaphor here about the feedback cycle between research candidates and their supervisors. Meerkats must be prepared for both possibilities, so it is for the research candidate when seeking feedback and guidance from supervisors. There is the safety zone, where you can dig into your burrow and work in the ways that make sense to you: creating extended concept maps, drafting and re-drafting, making landscapes of sticky notes, juggling the jigsaw of your ideas in the air or in piles on the floor, annotating pdfs, arranging notes in folder hierarchies or in a series of applications, keeping a log of your daily insights … or all the other ways of thinking, planning and writing which we know work for us. The zone of exposure is where we interact with our research supervisors. We want the rich protein of their feedback, but we also have to manage the risks of eagle attack and by this I mean discouraging critique. This is feedback which is well meant, but unintelligible, or about the wrong thing, or given at the wrong time, or feedback that we don’t know how to act on. Do they think I am moving too slowly? Am I not aware of all the literature I should know about? Are my writing skills not sophisticated enough? Like meerkats, research candidates know that the dangers are out there, but that these can’t keep them from going out to get the feedback that is needed to thrive. 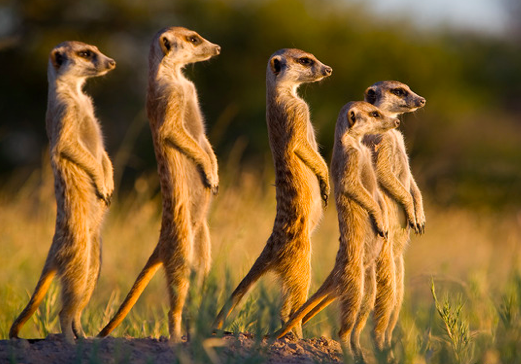 So research candidates need strategies, just like meerkats, for managing the movement between the zone of safety and the zone of exposure. Hunting close to the home burrow is not always enough for a meerkat – all the nearby beetles can get eaten up, and they have to go further and further into the danger zone to get more. So they find themselves some ‘halfway’ burrows, which they can go to temporarily, to extend their hunting range, bring them closer to the beetles, and bring more safety and comfort to the danger zone. I’ve seen clever research candidates using similar strategies to this. They value their own preferred ways of working, but they recognise that these are not the same as their supervisors’ ways of working and they know that they are likely to get extra nourishing guidance from them if they add some ‘halfway’ compromises to the feedback cycle. Here’s one example which has worked for some research candidates at my university: storylines. (This technique has been developed by Dr Claire Aitchison of the University of Western Sydney, and co-editor of the Doctoral Writing SIG blog.) Storylines can work as a ‘halfway’ meeting point between a person who prefers to exchange a whole draft of an article or a chapter for feedback, and someone who prefers to exchange feedback in the planning stages. We know that dryland salinity is a problem for agriculture – loss of trees, reduced production. In natural ecosystems, some fungus species which live on the roots can help trees to survive drought and also reduce the effect of dryland salinity. The fungi themselves are also affected by dryland salinity in a few different ways. We don’t know much about how the genetic diversity of the most important type of fungus is affected. Storylines are particularly good for feedback on content, structure, argument and logical flow – because they focus your supervisor’s comments onto the main ideas and the order of the key points. Storylines are not intended for feedback on writing style or grammar. In fact, part of the strength of this technique is that it ‘quarantines’ these aspects of your work, so that you get only the type of feedback that you can use in the current stage of your writing process. Storylines are a good halfway or temporary ‘burrow’. Some people do use them for their own planning and drafting process, but others use them just for the feedback cycle, and then feed the supervisor’s advice back into their preferred way of working, such as drafts, plans or mind-maps – Just like the meerkats, who come home to their nest after a day’s hunting. I might save the rest for the second instalment of my meerkat metaphor, but now I’m interested in what you think? There are a lot of other good strategies which people are using to meet their supervisors half-way in the feedback cycle. Have you been subject to eagle attacks when you thought you were going to get yummy beetles? How did you react? This entry was posted in On Writing and tagged feedback, feelings. Bookmark the permalink. « Mum and Dad are fighting – what should I do? Yes, yes we certainly are. But supervisors are eagles. I wish you were wrong, Cassily, but I think this is an apt analogy. It frames some essential elements of the student/supervisor relationship, especially what the power imbalance can feel like for the student. The storyline is one approach to creating the halfway burrow, where both meerkat and eagle can meet. I look forward to learning about other specific strategies. However, one problem I’ve encountered was that my eagle did not know how to operate in that middle space. In order to actually complete a storyline to the specific level you outline here, quite a bit of work needs to be done first. Developing the argument or narrative structure of the thesis has to be one of heaviest pieces of lifting in the work. The meer-student MUST be able to safely navigate a whole series of burrows, some collapsed, some successful, to get there. When communication breaks down, or something else goes amiss in the relationship, the eagle-visor can truly inhibit this work. So I think it’s just as important to have good communication and some ground rules about working from the outset, as it is to talk about what you’re producing. We need to learn better communication skills! Students and supervisors need tools for this and the culture of academia seems loathe to address it. Doesn’t matter what the strategy is, meerkat and eagle must both understand and agree to what is going on so they can achieve that together peacefully. I wish we could reframe the whole process entirely, and ditch the hunter/prey thinking/behaviour. This sets us up for these kinds of conflicts, misunderstandings, and sometimes, worse. Ha ha! That would make an excellent cartoon! And for the North American scholars among us, the Looney Tunes cartoon with Sam the sheepdog and Ralph the Wolf going to ‘work’ together in the morning, punching the same time clock, exchanging pleasantries, then becoming sworn enemies for their shift also comes to mind. I think your metaphor is apt, especially today as I have a meeting with my supervisors on the (whole) chapter I submitted a few days ago. I’m nervous and although my supervisors are lovely I’m worried that it might be an eagle attack moment, although that’s probably more a refection of me than it is of them. As to the idea of storylines for those looking for a compromise, part of me wonders if such measures could be avoided if supervisors and students had open communication and made their expectations clear. I was fortunate enough to work with my primary supervisor in my honours year, which meant that by the time I started the PhD, we both knew how each other worked and what each other expected. But that also took effort, keeping the lines of communication open and being honest about what could be managed between meetings – for me, if I could really write x amount of words, and for him, as a busy academic, how long he’d need to read it closely and carefully. I know through asking questions and making sure I wasn’t missing anything that he will have a look and provide feedback over everything and anything I want to send him, whether that’s a fifteen thousand word draft or a few pages of notes which show my thoughts and arguments developing. Now that I’m well into my PhD, our meetings always end with a discussion about what will be done between then and our next meeting, so that we all know whether I’ll be working on a full draft or rather collating notes on readings, sources etc. What I suppose I’m trying to say is that there might not be a need for storylines if everyone is on the same page. I’m well aware that my supervision is so different to many other people that I know, primarily because I get on really well with my panel. In that regard, while I don’t have a specific need to employ storylines, I can see it being a useful strategy for those who are struggling to get the feedback they require. But while I’ve known students who seemed to have drawn the short straw supervisor wise, I’ve also seen students who have struggled with their supervisors because they (the student) weren’t willing to have a conversation about mutual expectations and responsibilities, and didn’t let the supervisor know that they were struggling (meaning that the supervisor had no idea anything was wrong). While the student has every right to expect guidance and assistance as required, they also have to be willing to make sure that they are communicating with their supervisors. It’s a process and relationship that benefits and flourishes if both parties contribute and work on it. So true. Puts me in mind of what a clinical psychologist told me once – that the quality of the relationship between the client and the therapist is a strong predictor of the outcomes of therapy – a much better predictor of outcomes than the therapy type (e.g. cognitive behavioural or psychoanalysis) or how experienced or skilful the therapist is. Is this analogous to the outcomes of research supervision? You sometimes see a person who is on the same wavelength as their supervisor (or more typically, worked to get on the same page through early discussions and negotiations) have a great experience, and then another person will have a traumatic experience with the same supervisor, with all the best intentions on both sides. Meerkats is an excellent analogy. One that I would never have thought of on my own, but aptly describes the two contrasting modes of researching: sedate, academic comfort while researching; and the sheer, brain-tingling terror of having your comfortable position challenged. Insightful indeed. Bravo, and keep writing!